More than 200 Roman Catholic bishops from across Africa have called on corrupt political leaders in the continent to repent or step down. 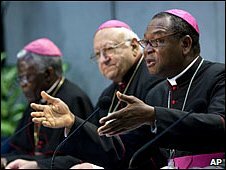 The bishops accused Catholic leaders in Africa of having fallen "woefully short" and also condemned non-Catholic leaders and outside foreign interests. These included multinationals that had damaged the environment and exploited natural resources, they said. The BBC's David Willey said the 12-page message was unusually strong. Reporting from Rome, he said that the message was issued from the Vatican at the end of a three-week closed-door synod. Our correspondent says the bishops named no names, but the Zimbabwean leader Robert Mugabe and the Angolan President Eduardo Dos Santos are two prominent Catholic leaders accused by their critics of corruption. "Many Catholics in high office have fallen woefully short in their performance in office," the bishops' statement said. "The synod calls on such people to repent, or quit the public arena and stop causing havoc to the people and giving the Catholic Church a bad name." The bishops also said Africa needed "saints" who could "clean the continent of corruption, work for the good of the people". One former African leader, the late Julius Nyerere of Tanzania, is being considered by Church authorities as a possible candidate for sainthood. The bishops' statement also offered a stinging rebuke against multinational companies operating in Africa. "Multinationals have to stop their criminal devastation of the environment in their greedy exploitation of natural resources," it said. But the bishops added: "Whatever may be the responsibility of foreign interests, there is always the shameful and tragic collusion of the local leaders." They said these included "politicians who betray and sell out their nations, dirty business people who collude with rapacious multinationals, African arms dealers and traffickers who thrive on small arms that cause great havoc on human lives". They also listed "local agents of some international organisations who get paid for peddling toxic ideologies that they don't believe in", a reference to groups that promote abortion rights.